Striding across the plains of east Africa, the Secretarybird is as characteristic and distinctive a symbol of the African veldt as an ostrich, a cheetah, or a lion. This fine photo by Dale & Marion Zimmerman of a Secretarybird (left) shows it in a characteristic stance in its most typical habitat. It is a large bird, standing nearly 4 feet (1.2 m) tall. The sexes are alike. The long legs are clothed in black "breeches" and those legs can produce a powerful kick which can disable most other animals, but the feet have very little grasping ability (Kemp 1994). The long black crest, flowing down like a ponytail in this shot, can be elevated when the bird is excited or alert. The beak is heavy and curved and, with the bare skin around the face, recalls caracaras of the New World. These head details are nicely shown in the shot (below) by Ed Harper. The Secretarybird has always been placed in its own monotypic family near the birds of prey, and molecular analysis confirms a relationship with the falcons and hawks, on the one hand, and the storks on the other (in flight, the Secretarybird does recall a stork). 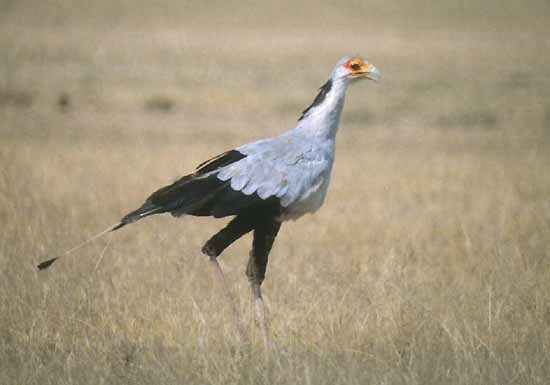 While the modern Secretarybird is confined to Africa, fossil evidence suggests close relatives once existed in the Middle East and southern Europe (Kemp 1994). As they live in similar habitat to several species of caracara, and they capture live food like falcons, it is not surprising that they have evolved to fill a niche in Africa that is similar to the caracaras of the New World. However, there is another New World family that is not so closely related that has evolved a similar size and body shape: the Seriemas of southern South America. I was surprised when I first saw a Secretarybird, and again years later when I first saw a seriema, of the large size and the graceful strides of both birds. One big difference, though, is that sereimas are quite vocal -- they live is much denser scrub country -- while secretarybirds are usually silent (but enraged secretarybirds can give a geed guttural croak of near roaring intensity; Kemp 1994). 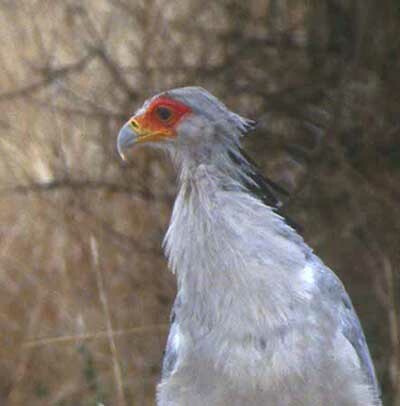 Secretarybirds occur in all types of grassland and open savanna habitat, including desert-like open scrub, in sub-Saharan Africa. They prey on a wide variety of animals that are subdued with fast hard kicks. They are most famous as snake-eaters, including poisonous cobras and adders, but they readily eat gamebirds, plovers, chicks, mongooses, and rabbits. All but the largest prey are swallowed whole. Birds are usually encountered in pairs as they walk through their large territories. The bird below is doing just that -- on its route searching for prey -- as the wind whips up its crest and back over its head. Nests are huge flat affairs of twigs and grass in a short bush or tree. Both sexes help build these after undulating aerial courtship displays. Adults feed very young chicks a liquid diet or partially digested insects, but then switch to a meatier mix as they develop. Two chicks per nest is typical and, unlike many other types of birds, intramural squabbling and aggression between the youngsters is rare. It used to be thought that the name "Secretarybird" referred to the long crest feathers which can appear to look like quill pens "stuck between the ears of a medieval scribe." However, it has recently been proposed that the name may be a Francophone corruption of the Arabic saqr-et-tair which means "hunter-bird;" (Kemp 1994). Though perhaps less fanciful, that latter explanation makes more sense to me. Photos: The top left photo of Secretarybird Sagittarius serpentarius was taken by Dale & Marion Zimmerman in Amboselli Reserve, Kenya, in Sep 1981. W. Ed Harper contributed the close-up head detail from a visit to Tarangire, Tanzania, in July 1999. My own photo (bottom shot) is from Masai Mara Reserve, Kenya, in Nov 1981. Photos © 2000 by Dale & Marion Zimmerman, W. Ed Harper, and Don Roberson, as detailed above; all rights reserved. The photos by the Zimmermans and by Harper are used with permission. There is no "family book" per se, but an excellent introduction to this family, with some fine photos, is in Kemp (1994). Kemp, A. C. 1994. Family Sagittariidae (Secretarybird), pp. 206-215 in del Hoyo, J., A. Elliott, & J. Sargatal, eds. Handbook of the Birds of the World. Vol. 2, Lynx Edicions, Barcelona.